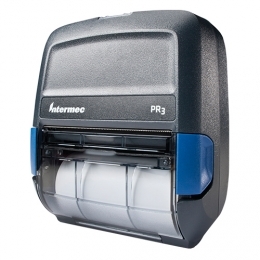 Easily print high value receipts and invoices mobilely - with the PR3 receipt printer from Intermec, of course. Use the 84 mm printer flexibly in numerous applications both indoors and out mobile POS applications, receipt and invoice printing, etc. The optionally available magnetic stripe reader expands the variety of applications of this compact printer. Its robust housing protects it against dust and splash water IP42-certified, as well as falls from medium heights. In short it holds its ground on a challenging daily basis.